Joe’s Dairy Bar and Grill is nearly anywhere on the Internet you’d imagine. We enjoy providing you with multiple servings of digital comfort food…so come and get it! Click on any of the buttons below to visit us via social media! Our YouTube channel is worthy of its own spotlight–it’s fabulous foodie fun! Subscribe to it by clicking here so that you can enjoy a regular helping of our digital comfort food and to learn about the flip side of how Joe’s Dairy Bar and Grill makes its meal magic. New videos are published to the channel every Monday, Wednesday and Friday! If you’re on your way to or from work (or school) and just…don’t…want to…deal? We’ll keep you company via our podcast, found on iTunes, Spotify, Stitcher and more. 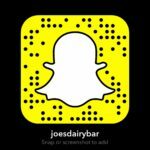 You never know what delicious details we’re going to share with you in the Joe’s Dairy Bar and Grill blog, which you can visit by clicking here. If you want extra helpings, inside scoops and juicy seconds, you can’t do better than our blog. In the blog version of our Digital Comfort Food ™ you’ll learn tips, tricks and maybe even a recipe or two so that you can have a little more JDB in your life. And there’s nothing wrong with that, JDB Family!